Royal Crown Cola Miss Lindy Lou Ad 1939 This is a May 1939 advertisement. It is a nice color ad from Royal Crown Cola with nice graphics from an early magazine. Miss Lou has a secret, an icebox full of Royal Crown ! In mint condition. Photo is taken through plastic and may show wrinkles or crookedness that is not in the ad. This magazine tear sheet measures 5 1/2" wide by 11" tall. 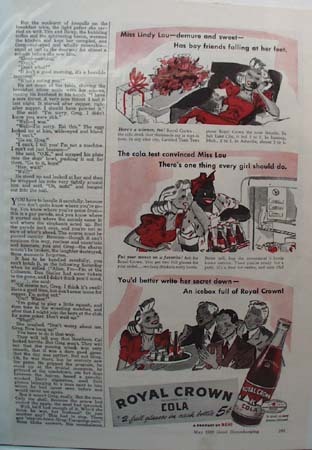 Items Similar To "Royal Crown Cola Miss Lindy Lou Ad 1939"